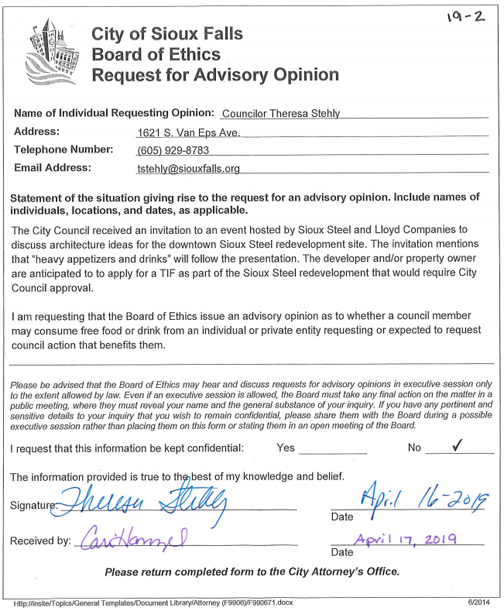 UPDATE: The SiouxFalls Board of Ethics met on March 28, 2019 to hear testimony for an advisory opinion concerning the propriety of a city employee joining a company board and then receiving any honorarium payment for it. The Board of Ethics decided it was proper in this situation, and others, to be part of an advisory board but a city official in any capacity will not receive any payment, meals or reimbursement of expenses for such service. In simple language, if you are a city of Sioux Falls employee or elected official, you better not be receiving any money or anything of value for your service. This is the second opinion in two years where a similar decision was made. We have been told there are city officials who are part of corporate, state and national boards and some may be receiving some types of remuneration or payments. 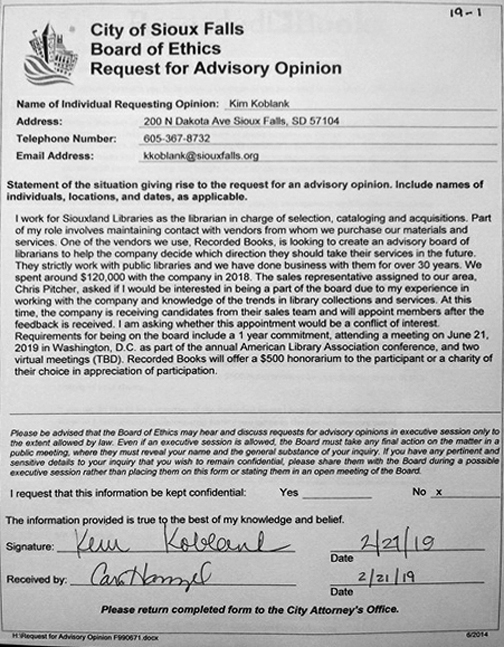 As the ethics board determined in the past when it comes to gift cards to emergency responders, they told a librarian in an ‘advisory opinion’ today she could serve on a board but couldn’t take a contribution from the organization, even if it was charitable. I think Cameraman Bruce filmed the event (I think he was the only media in attendance today, guess he wasn’t scared of being ‘stuck in the middle’). It seemed logical. One of the items of discussion is an advisory opinion filed in February. I’m trying to find out what that is. Wonder if it has anything to do with the new Housing Director running for the Tea City Council or if Neitzert is asking to take tips for his imaginary taxi job again? I did not attend the meeting but was told by a foot soldier that the BOE told councilor Stehly they could not give her an opinion based on asking hypothetical questions. She did not tell them a specific petition drive she would be working on. However she did argue that former councilor Staggers and Erickson have circulated petitions. Speaker of the House Mickelson lead a state wide petition drive and the county commissioners have circulated petitions in the past. The precedence is there. This isn’t rocket science. It just sounds like they want to say NO but they need her to bring something forward solid so they can have a quasi-argument to say NO to. Bruce’s column appeared in today’s Argus Leader, read the whole column HERE. The Home Rule Charter is our city constitution. In theory it is to protect us from abuse while giving local government more latitude to meet statutory needs such as fixing streets, utilities along with fire and police protection. I am a strong proponent of a balanced government structure, without authoritarians ruling the day or weak elected officials being pushed around. We need a balance. 1. The charter establishes a mayor to be elected by the people to lead the city government and its employees. 2. The charter created a city council to be a policy making body to set the rules for the mayor’s administration to follow. 3. To keep everyone on a straight and narrow path, the charter has a section called ethics to keep everyone in order. The secrecy in SF city government is bad enough, but without a strong balance of ethics, we as citizens have NO recourse.